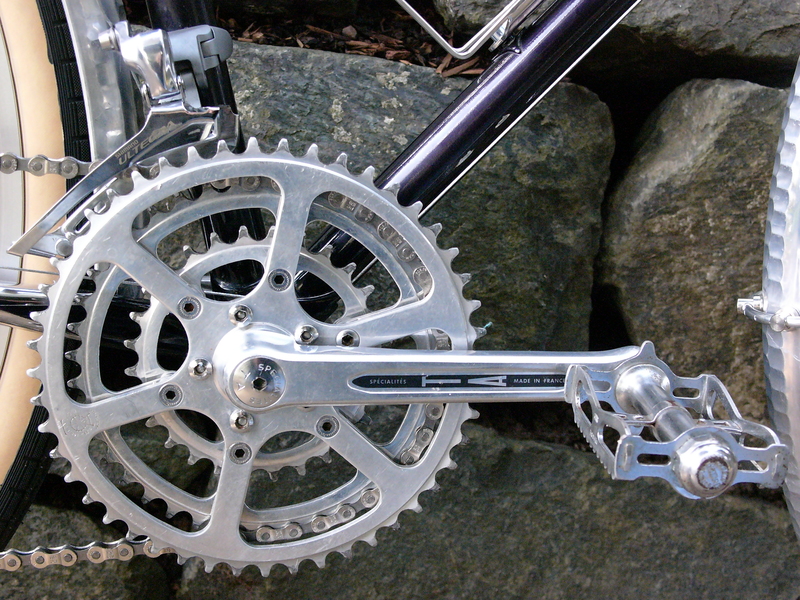 Vintage TA crankset with triple rings – 48/40/28. The lovely & vintage TA crankset which I selected for my 1980 Meral 650b conversion has been an unusually frustrating interaction between the characteristics of vintage components and modern cycling requirements. 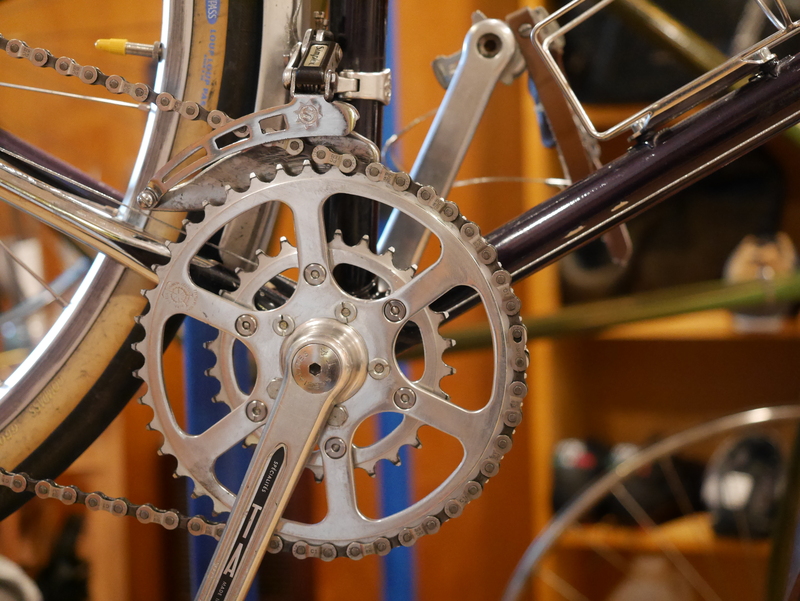 I chose this component for two reasons: the crank arms were 160 mm, helping me to eliminate toe overlap on my 1980 sportif frame; and, since the Meral came with a TA bottom bracket, I thought it would be nice to match it to a TA crankset of the same era. But this crankset was problematic. The big ring had a massive wobble that I had straightened a few times in my vise. 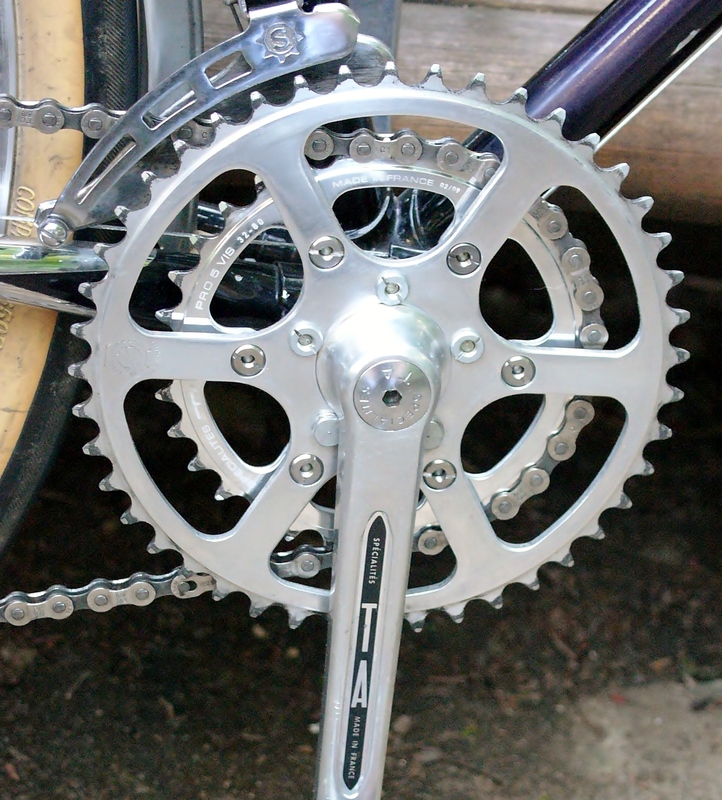 And, even though I use a similarly geared crankset on my Terry – a Shimano 600 with 48/40/30 rings – there was something about the TA rings that never really came together. I never landed on my “cruising gear” even though I went through two different cassettes and two different front and rear derailleurs. And, the drive train was always noisy, even after trying a few different chains. Some frame-up builds come together perfectly, and some require more tweaking. The Meral ended up being in the latter camp. Version 2 with TA 44/28 rings. I decided that I might prefer a compact setup for this bike. Since most of my current riding is commuting, it is important if only for safety reasons not to have to worry about gear selection while riding. 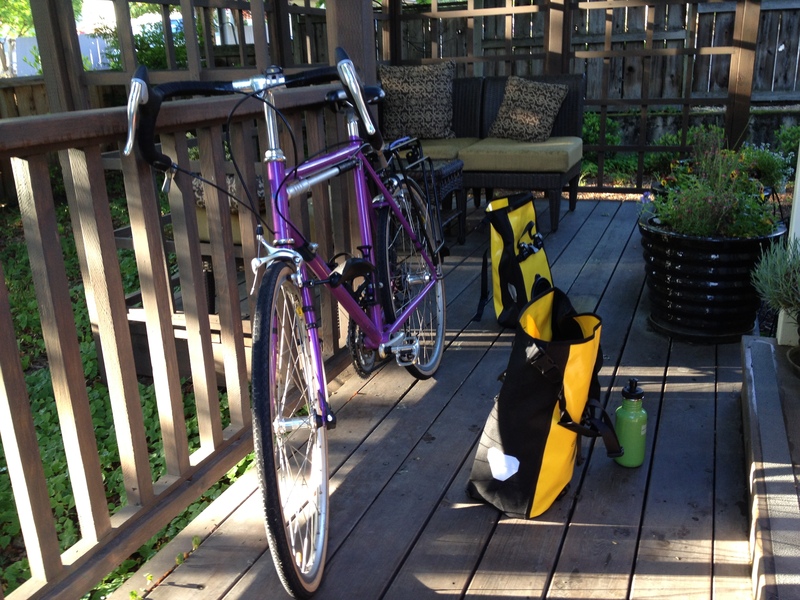 My other bikes provide easy and intuitive gear selection, so that my eyes can stay on the road. A large tooth difference between the chain rings was de rigueur back in the heyday of French cyclo touring. So, maybe it would work for me too. I sourced NOS TA 44 and 28 teeth rings on eBay. The rings are very pretty, and gave the Meral a real “French” look. Unfortunately, for my kind of riding, the 28 tooth ring did not work at all. Essentially, I was now riding a bike with a single chain ring plus a bail out gear, rather than a regular double crank which allows for even steps between the gears. And, shifting between the two front rings often required a triple shift to maintain cadence. 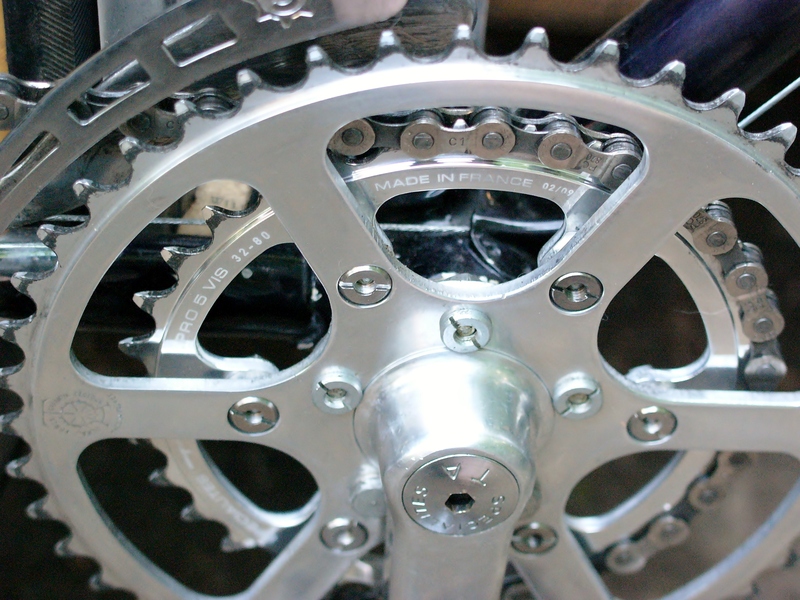 To make matters worse, the small chain ring was noisy in certain gears due to the extreme angle of the chain, front to rear and side to side. Version 3 with 44/32 rings. Beautiful new TA Pro Vis 32 tooth ring. Not one to give up, I decided that a larger toothed small chain ring would be the answer. I ordered a brand new 32 tooth TA ring from Boulder Bicycle. The new ring is beautifully etched, and looks quite fine with the older crankset. Even better, after installing yet another cassette (a SRAM 7 speed 12-32) to accommodate this new gearing, and adding a few links to the chain, the bike’s gearing is perfect for what I need. My new gear inch range is 26 to 95, with even steps between the gears. My shifting pattern is normal, and I have a cruising gear on my big ring that matches a comfortable cadence on a flat surface. While I was at it, I adjusted the Simplex Super LJ front derailleur lower to make my front shifts crisper. This front derailleur uses a parallelogram with an extreme angle, so in order to make it work well, it needs be about 1 mm above the teeth of the larger chain ring, rather than the usual 2 or 3 mm, to achieve ideal shifting. 1980 Meral 650b as currently configured. This bike was meant to take the place of my old beloved 1976 Centurion Pro Tour, which I crashed irreparably in 1999. It has been a “long and twisted road” finding the right bike which can carry me not only to work and back, but to the undiscovered as well as the familiar. But this is what I have been yearning for. A soul mate. 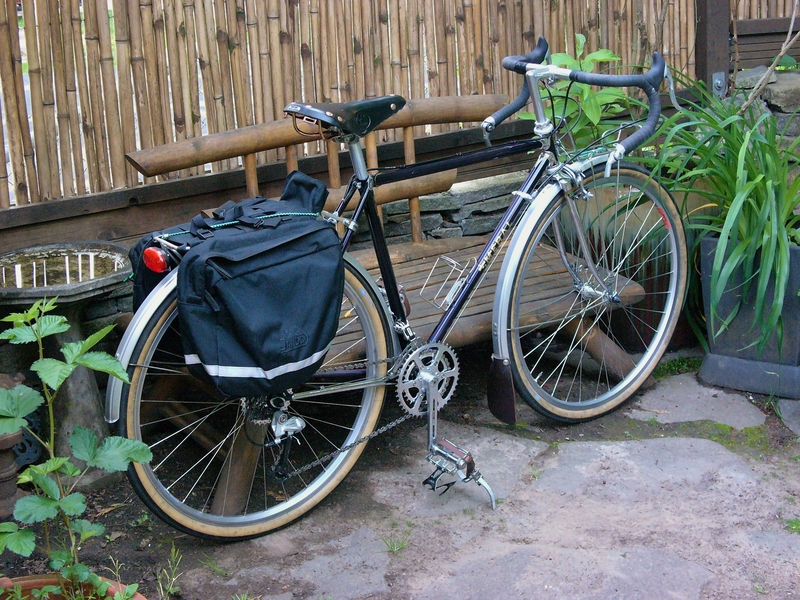 This entry was posted in 650B, 650b conversion, Bicycle restoration, Commuter bicycle, constructeur, French bicycle, Meral, Simplex derailleur, Terry, Terry Bicycles and tagged 650b, 650b conversion, Centurion Pro-Tour, French bicycle, T A crankset, vintage french bicycle by Nola Wilken. Bookmark the permalink. Hi! The bike looks great. It’s unfortunate that you had to go through all of that, but look at all you learned! All three chainring configurations looked really nice. I wanted to ask you if, at any time, you had considered trying just the original 40-48 rings. My 48 tooth ring had a wobble that would not go away. Basically, the ring is too big for this size bolt circle diameter. Peter White has a detailed discussion of the pros and cons of the TA Pro Vis crankset. He recommends no larger than a 46 tooth ring on them. At any rate, I also needed some lower gearing than I previously had in order to climb steeper hills, some of them on dirt and gravel. Now I have a very versatile crankset that will hopefully work well in a variety of situations. I have a 160mm TA crankset that has been cursed and is unfortunately stuffed away somewhere…again after attempting to install it last month. My sort of bike mechanic husband had put some french threaded pedals on and have been stuck on them for 3 years in the bike bin! i recently read that they can be either french or english threaded and the pedals didn’t work for me so we tried taking them off and disaster ensued. One did come off but the other one is stuck and I will have to find someone who can grind it off or something. He then tried putting on some english threaded pedals and they didn’t work, so after all that they are french threaded, so will have to have them rethreaded by someone who knows what they are doing as we’ve done enough damage… The correct bottom bracket has also been an issue. sheldon brown had recommended a specific one but we were using what we had…. so it went on and off a bicycle last might with much stress! There is a ‘run out’ issue and bit of flex that I recall from when it was temporarily installed on a bike…that frame had some serious issues so off everything went…..
TA do make new chainrings for the Pro Vis and good to know you can get them from boulder bicycles. My chainrings are 36/46. I worry that 46 is too small for the big ring as I actually like higher gearing from a few years of riding vintage road bikes with 80’s limited range. But Peter White does not recommend going bigger than 46? alas. I might still try. most importantly, how do find the 160mm crank arms? That was my main motivation aside from the french cyclotourist fantasy. but I may end up going to sugino who do make more than a few cranksets in 160mm or even 155mm which might be even better. (but even sugino cranksets with smaller than 165 crank arms are not available in canada!). I did feel lucky to win l’bay bid on the 160 mm ta cranks, but they’ve been cursed and I lack the skills and patience to deal with their current state. I will take them into Vancouver one day to a bike shop that will appreciate them. According to the crank arm length charts or calculations 155 or 160 are best for me, but of course near impossible to find. I have little experience with them other than my vintage raleigh sprite that has 155mm crank arms. Cottered of course. It was my period correct/original parts fun summer ride for a few years but the original tires finally died of a slightly obsolete size so ‘magenta’ is out back looking sad. I am considering upgrading it with some modern components and 650b wheels that stop in the rain. I always enjoy riding that bike and the shorter cranks could be part of it. The gearing is crazily high though which I also love. Being so short I know the 170mm crank arms are not ideal, possibly damaging… but bike mechanics et al will argue how much difference can a few millimetres make? I did read somewhere that smaller chain rings will run higher with shorter crank arms or something to that affect. Which I assume is why such cranksets tend to have smaller chainrings. I tend to ride with 50 or 52t and on the smallest rear cog much of the time on 170 mm cranks. I am looking at an enticing nos miche crankset with 155mm arms on l’bay. It would be a less expensive alternative to put shorter crank arms on a bicycle with scary toe overlap than to replace brakes and wheels to 650a. Maybe I can put a few things in to help. I wouldn’t go by charts on crank length too much. Generally for anyone under 5-6 they are going too long using even 165 If set up properly. The key is some factors I spent about 20 years studying including working with Jim Martin a bit back in the days of racing. When I raced short cranks were not around and I suffered for it. Most were BMX. What you want to watch for is a crank that has a Wide Q factor. Most have no clue about how to setup for short cranks but the main thing is not to ride a triple and as you know the TA cranks are great at being close together (low Q). If your shorter your legs are getting a lot of activation of muscles but you have resistance over the top and a hard time spinning efficiently. I can spin super fast, 250+ rpm as a sprinter but that does not mean I can spin 125 rpms efficiently. I found 160s not a big enough jump to warrant changing. There is something very special about 150 to 155 range I have found. First since this is too long already, don’t raise your seat, even lower it a tad. Second put your seat flat. Third move it back as far as it can go. Yes don’t even think of riding short cranks with a 74ish seat angle and forward or mid rail on a standard seat. You have to get way back. This is because short cranks moves the power phase of the stroke (down and flat thru the bottom…Further back). So if you go shorter, go back .And don’t think since you moved an inch shorter, you move the seat back an inch, or since your cranks shorter you go up an inch. It seems like its true its not. Why? Long story but mainly you need to use your gluten more with short cranks, the only way is to go back and to lower your seat . High seat and Forward equals No Glutes. No glutes is the missing piece to power and speed. Plus if you know what your doing (the stroke is down and thru, not down, not up) down and straight thru the bottom stomping and scraping your shoe in your imagination. Forget pointed toes and it ridiculous ankling which is never really even explained properly and all it is really is a way of making a crank shorter. The best crankset going is the Sugino XD600 152. Its a triple and I think a double. Its has a major issue though, a huge Q factor. Its horrible. So the only way you can solve it is to use a 103 Bottom Bracket, called Messenger by Sugino and everyone will tell you it will not fit and this and that, but all my Japanese touring I can fit it. In fact put it on dry and super tight, then take it off and then put it on super tight, ride and Re Tighten super tight. How tight, well your not going to be able to overdo it with a crank tool and your two hands. Watch Out for the chainring. No chance of damaging no matter what you hear. And only grease the bolt and washer with grease, not the taper. Clean taper with wd40 and then install. A very good option, is the Affordable Sinz cranks. You can shave them a tad if they don’t fit. I think a Shimano 107 is nice or 103 if you can fit it. Depends on your bicycle. Short Q factor means more efficient driveline, a lot less flex on the frame because less lever. And its amazing, Simply amazing if your short and rode with 165 and 170 all your like. You will never go back. I feel like I can move totally comfortable and not feel awkward or unbalanced. You can stand forever and spin like no tomorrow. Its worth it. Just make sure narrow Q. Don’t use Sinz cranks with a non square taper style and tighten this crank extra also. They are very strong. Lastly there is another excellent crank. The Sugino being a square taper classic design is best for classic touring bicycles of course and can take Any chain from 7 speed Sedis of old to 10 speed pathetic chains from now a days. Oh the other cranks is Origin 8. Its the higher end model at $ 55 only. Black looks nice, not a classic look. Shorter cranks produce much more power strokes per minute. Your ride about 20% more rpms after you get use to it. You want to spin and keep it revved at the edge of spinning too fast. Stand a lot and close ratio rings up front are good. A 36-48 I believe was nice. You cant ride big gears and don’t try. You don’t need more than a 14 tooth on touring wheels. So forget an 11 or 12. Good news is your can ride a large range of gears because you can ride from 90 to 125 rpms instead of 80-90 on 170s or more for example. Your like a 2 stroke if you have ever ridden one. Well thats all. Way too long but I hate to see people riding long cranks and suffering. The short cranks are the thinking riders cranks. If your ride poorly and slug the pedals and are not interested in being in tune with your bicycle, stick to 170s. Other things, you can lower your handlebars about 2 inches and feel more comfortable. It also feels good to run Rando bars in the 37mm range. Nobody really needs these truck wide handlebars of 42cm and more. Try 36 and short cranks and you’ll never regret it.